1. Supporting survivors can help them feel empowered. Most survivors stay silent about sexual assault and abuse due to “victim blaming,” cultural misunderstanding, familial backlash, lack of meaningful criminal justice, and psychological impacts of sexual trauma. By supporting survivors, we let them know we believe them and honor their bravery...we've got their back in speaking up. Even though there are a lot of reasons to stay silent, we let them know by our encouragement, there are good reasons to speak up as well - namely for their own empowerment. Reclaiming their voices from sexual trauma is important. 2. Providing a crucial step toward recovery. Research shows that safely speaking about trauma is a first key step in recovery from sexual trauma. Therefore, supporting survivors can lead to increased recovery in those who've experienced sexual trauma. 3. Paving the way for other survivors speaking up. If we support survivors, more will speak up. As Gloria Steinem once said, "Whenever a person speaks up and says, 'Wait a minute, this is wrong,' it helps other people do the same." 4. Stopping further sexual violence. By survivors speaking up it can expose perpetrators who tend to prey upon multiple victims. They can no longer hide out in the shadows. With exposure, they may even be prosecuted, preventing them from initiating future assaults and abuse. 5. Reducing the stigma around the topic. If we keep engaging in the conscious conversations surrounding sexual violence, it can help decrease the stigma associated with being a survivor of sexual violence. This can help increase public knowledge and understanding of sexual violence, leading to better outcomes all around. 1. Support survivors on MapYourVoice’s map by clicking the support “buttons” and showing survivors you believe them. 2. Join our Twibbon campaign, https://twibbon.com/Support/supporting-athlete-survivors, and support athlete and student survivors of sexual assault, who have been taken advantage of by coaches, doctors, and others in positions of power. 3. Check out our infographic on how to support survivors and use these tools and tips to support friends and family members who've experienced sexual trauma. 4. 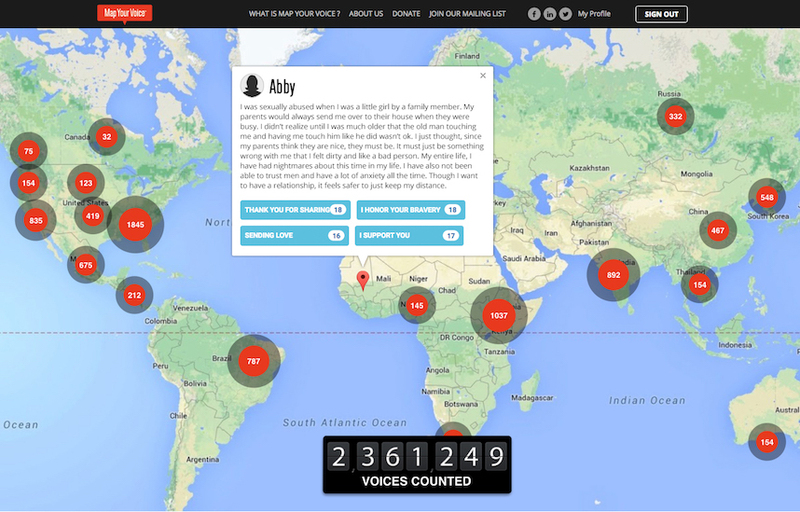 Explore all the great ways to Get Involved with MapYourVoice to make a difference.